The only thing nicer than a quality ASL product is a series of ASL products of dependable quality. There is no better example of this than Friendly Fire. Seven times now, Mattias Rönnblom and his circle of evil international minions have created a scenario pack with scenarios that are varied, imaginative, and competitive. I think it is worth reflecting on this for a second. Has any other producer of ASL materials, official or unofficial, had a track record of such solid performance? I think there is a good argument to be made that the answer is no. Though there are other producers of ASL products that consistently have good releases, it is hard to think of one that still does not have the occasional dud or redheaded stepchild every now and then. So far, Friendly Fire Packs have led a charmed life–they are essentially the Pixar of ASL. Moreover, they have not succumbed to the lure of creating ever expanding number of scenarios, or trying to reach new heights in terms of scenario size, or trying to expand the number of products they release. Their formula is short, simple, and successful: produce a solid, well-playtested scenario pack a year. Hopefully, they can continue to keep that quality high for years to come. As long as they do, ASL players will come to the late summer/early fall ASL tournaments in Europe and the U.S. where Friendly Fire first tends to be released with great anticipation and eagerness. As has probably already been surmised from the above, Friendly Fire Pack 7 maintains the high quality of its predecessors. It is a pure scenario pack–there is no “sequel” to the board that appeared in Friendly Fire Pack 6. It features designs by Mattias Rönnblom, Peter Struijf and Chris Mazzei, and Michael Koch. 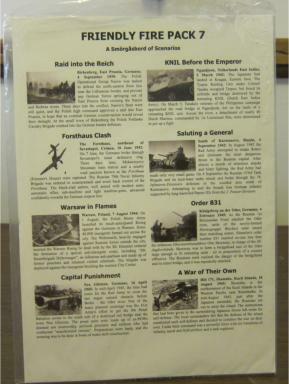 The eight scenarios feature a variety of actions from across the span of World War II, including: Poles vs. Germans (Germany, 1939), Dutch vs. Japanese (Dutch East Indies, 1942), Soviets vs. Germans (Soviet Union 1942 , Germany 1945 ), Polish Partisans vs. Germans (Poland, 1944), and Soviets vs. Japanese (Kuril Islands, 1945). There are no “Western Front” or “Mediterranean” scenarios. The scenarios provide a good and pretty even mix of small, medium, and large-sized scenarios (none are very large). Air Support appears in one scenario; no scenarios use OBA or Night rules. Players, especially those who don’t own every ASL product, will want to pay attention to the boards required to play the scenarios. Every single scenario requires some recent ASL product or another in order to be played; there are no scenarios that use only older “traditional” boards. 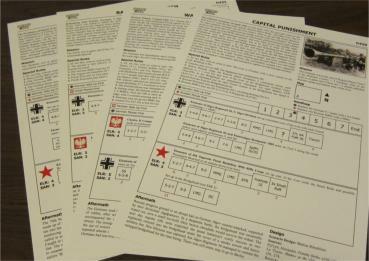 One scenario, FrF57 (Warsaw in Flames), utilizes the Valor of the Guards map to represent part of Warsaw. Two more scenarios, FrF56 (Saluting a General) and FrF55 (Forsthaus Clash), use the FrFA board that appeared in Friendly Fire Pack 6; the latter scenario also uses ASL Starter Kit board u. The boards required to play all the scenarios are the following: 4, 5, 18, 42, 56, 57, 58, u, 2a, 3a (2 scenarios), VotG, FrFA (2 scenarios). In addition, one scenario (see below) uses several counters that can only be found in the Bounding Fire Productions product Blood and Jungle. Because of these board and counter requirements, this pack is a sort of “advanced” pack, though it is one’s collection of stuff that must be “advanced” in order to take advantage of the scenarios. As is typical, many of the scenarios feature very interesting actions. One such is FrF53 (Raid into the Reich), which depicts a Polish cavalry raid into Germany in early September 1939. The scenario thus begins with the novelty of a Polish attack in 1939, as well as the use of cavalry. The goal of the Poles is to control two buildings and to capture or destroy two wagons (representing wagons full of ammo and food). The defending Germans have 9 2nd line squads, a MMG, and a 50mm MTR (and a few entrenchments/fortifications). 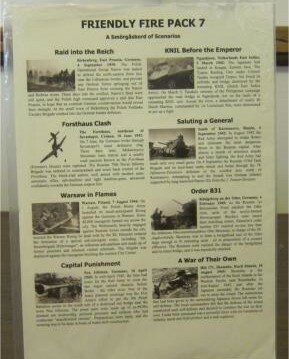 The Poles have 12 elite squads (all of which can enter as cavalry) and two TKS tankettes. Seven of the squads enter as reinforcements; any/all of them can choose to enter later in order to get a more advantageous entry area (this will almost be mandatory in order to reach the back building in time). Because the scenario involves cavalry, and because the Poles will almost certainly be forced to use at least some of their troops as cavalry to get where they need to go, the scenario is likely to be a bit dicey, and the German MMG and MTR could play a disproportionate role if they get lots of ROF. It is for this reason that the Germans probably have an edge in the scenario, but the situation itself is still a very fun one to play–and despite its small size, the flexible entry area (and flexible wagon placement) makes the scenario fairly replayable. Another interesting scenario is FrF54 (KNIL Before the Emperor), a Dutch-Japanese clash that takes place in the Dutch East Indies in March 1942 (KNIL is the acronym for Royal Dutch East Indies Army). There have been relatively few scenarios depicting any of these actions (though Paul Kenny/Fanatic Enterprises has designed several). This particular scenario is one of the larger ones in the pack and could easily feature a couple of different “mini-battles” going on at the same time. The Japanese objective is to launch a bridge assault across a river to capture the town beyond the river. Though they get a few “infiltrators” that can enter the board already on the other side of the river, the bulk of their force must get across the bridge first. The Dutch (oddly represented by Axis Minor counters here) have a small but elite force defending the bridge, and a larger but worse force (conscripts, plus some 1st line reinforcements) defending the town. The bridge force (which sets up HIP) must slow the main Japanese force down and cause as many casualties as possible. The Dutch get 3 armored cars to help them–however, these counters appear only in the Bounding Fire Productions’ Blood and Jungle module, which is thus required to play the scenario. Like a lot of bridge crossing scenarios, this one could be dicey. If the Japanese get some smoke and if they can damage/flush out some of the HIP bridge defenders, they might waltz across. On the other hand, if they all have to pass through multiple hexes of Residual FP, the survivors will have been significantly whittled down. It’s an interesting scenario situation, made more interesting by the combatants. FrF56 (Saluting a General) is likely to be a popular scenario, as it is a tournament-sized Soviet/German combined arms action (pitting a bunch of Mk IIIs against Lend Lease Grants and Stuarts). FrF58 (Order 831) is a similar tournament-sized East Front action (again, with some Lend Lease tanks; in this case, Shermans; the Germans also get a RCL). It was popular when it debuted at ASLOK, though early indications suggest a German advantage. One last scenario deserves mention, as it represents a very interesting (historical and gaming) situation. FrF60 (A War of Their Own) takes place on Shumshu, one of the Kuril Islands north of Japan (disputed between the Japanese and the Soviets). The action depicted actually occurred on August 18, after the formal Japanese surrender, but the Japanese desire to keep the islands caused local commanders to oppose the Soviet landing regardless. In the scenario, the Japanese basically have to clear the Soviets from a hill line. What makes the scenario interesting is the composition of the attacking forces. Though they are on the attack, the Japanese have only 6 squads (2 of them second line) of infantry, versus 12 defending Soviets squads (plus two more as reinforcements). What will make the difference for them are the Japanese tanks–6 of them–and perhaps most importantly, 2 Japanese artillery pieces, one of them a 150mm gun. The Soviets are well armed, though, especially relative to the weak Japanese armor (2 LMG, 2 MMG, 5 ATR, a 76* INF gun, and a 45LL AT gun). It is an interesting example of an action featuring asymmetrical forces. All in all, Friendly Fire Pack 7 is yet another quality pack from Friendly Fire, allowing them to maintain their reputation as the best current third party producer of ASL products (in terms of pure scenario quality). It is well worth getting, assuming one has (or intends to get) all the maps and counters that are needed to play the scenarios.